Original music written by Jon Babb. Uploaded to Planet Elder Scrolls in the 2000's and moved here. Includes the Overdose 3: Extension. I am reuploading my Morrowind Music Overdose series here on Nexus. I originally composed this music for Planet Elder Scrolls, but as you may know the website is now abandoned.I must warn you that the music is old, but it is a piece of history that is evidence of my struggle to become a better composer. The third and possibly final release of Morrowind Music Overdose. 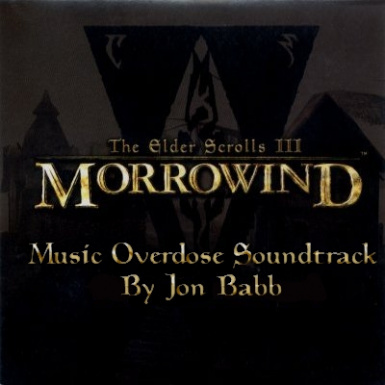 The Overdose series is an attempt to add some diversity in Morrowind by adding different music themes. Even in movies, music is used to capture the right mood within the film - Morrowind may not be a movie, but it sure could use some different music rather than the old music by Jeremy Soule. With much contemplation, this release is smaller than the other ones, and it should not be as massive a download. But don't let the small size fool you, a lot of careful time was spent into this project to bring you the best there is. please feel free to use the comment form below. Also, please read the Readme for installation instructions. 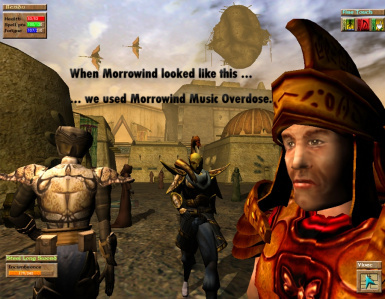 Hello, thanks for downloading the expansion for Morrowind Music Overdose 3. There are eight new songs in total; 2 Explore and Special tracks, and 4 Battle tracks. I simply added these songs as I thought MMO3 needed a little something more. You may place these tracks with your existing music in your Morrowind music directory.